Easy Underwriter is an online underwriting calculator which can help you to get Medical and Financial underwriting suggestions of LIC policies in few simple steps. 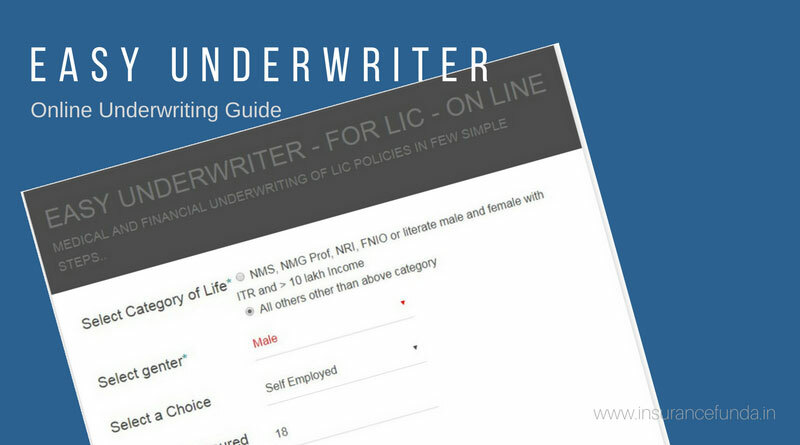 Medical and Financial underwriting of LIC policies are becoming more and more complex day by day, owing to new categories and sub categories being introduced by LIC. Easy Underwriter, being an online software,is intended to help you in all situations and is also mobile optimised. If you are unable to view the calculator click here to load the html version of the page. Maximum Rated up Sum Assured allowed is 200 lakhs subject to Parents Insurance and adequacy of Income. With out matching parents insurance- with PWB 25 lakhs and without PWB 10 lakhs SA only allowed. For major students maximum TRSA allowed is 200 lakhs with and without parents insurance. LIC Circular on Introduction of LIC’s Critical Illness Rider.